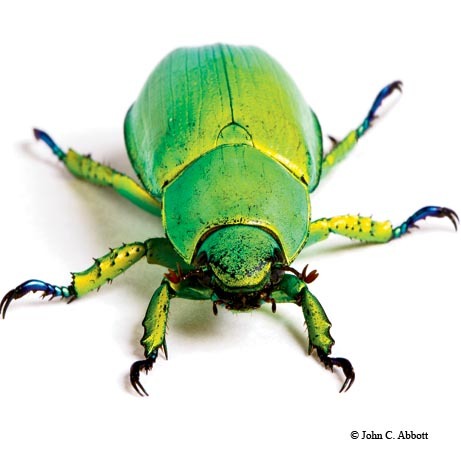 A jewel beetle (Chrysina woodi), from the Davis Mountains, is one of the few animals on the planet that can see circularly polarized light in the same way that we use glasses to view 3-D movies. 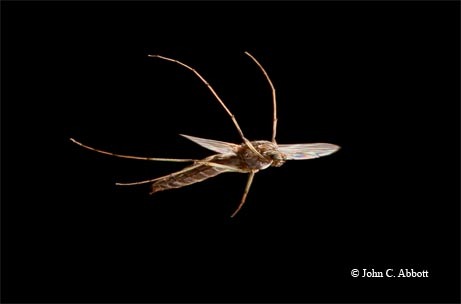 A non-biting midge in flight with its front legs raised. The unusual-looking waved light fly (Pyrgota undata) deposits eggs on the backs of June beetles. 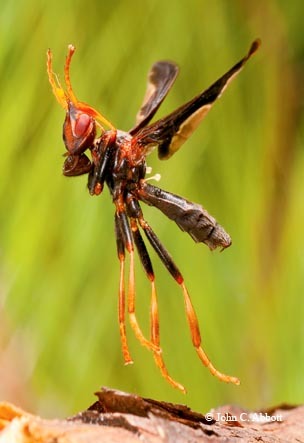 The larvae become parasites of the beetle. 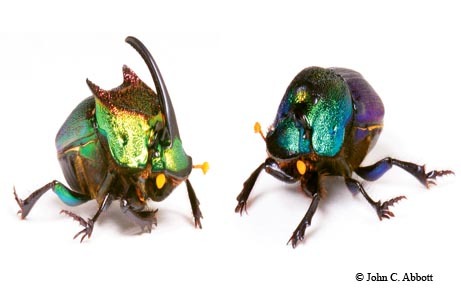 These striking dung beetles — the male and female rainbow scarab (Phanaeus difformis) — are commonly found in cow pastures throughout Texas. 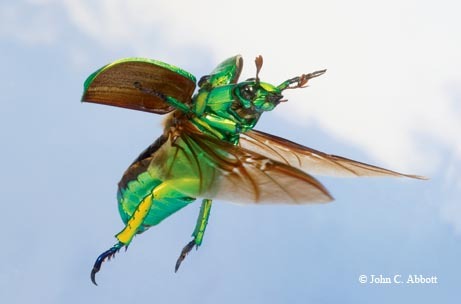 A brilliant jewel beetle (Chrysina woodi) flies between walnut trees in the Davis Mountains. 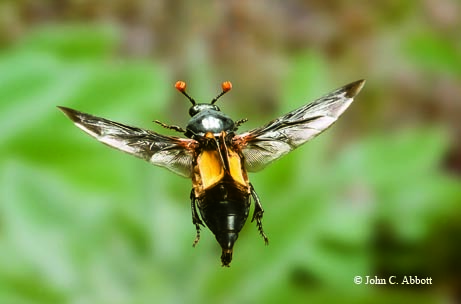 The burying beetle (Nicrophorus carolinus) mimics a wasp while in flight by inverting its elytra (forewings). A pair of these intriguing beetles will bury a small animal carcass, lay their eggs on it and then guard the young as they feed. 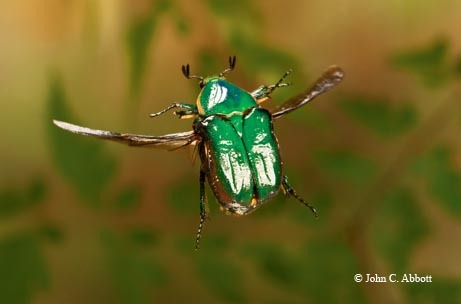 The emerald euphoria (Euphoria fulgida) is a common visitor to butterfly bait traps in the spring. 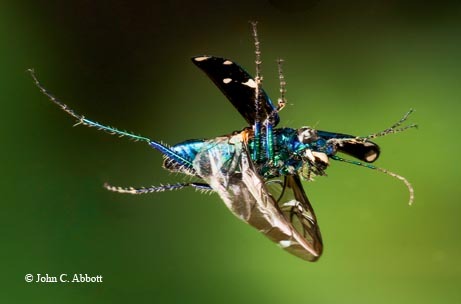 The six-spotted tiger beetle (Cicindela sexguttata) is equally capable of avoiding predators by flying in the air or running on the ground. 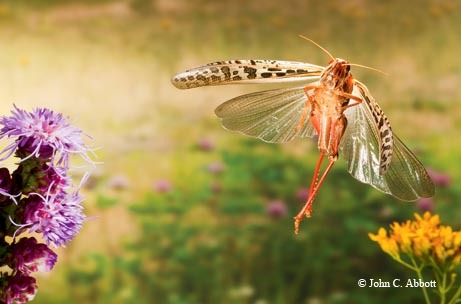 The American bird grasshopper (Schistocerca americana) gets its name because of its large size and its abilities as a strong flier.